Professional Drag Racers Association (PDRA) officials announced today that FuelTech will be the presenting sponsor of the first race of the series' sixth season. 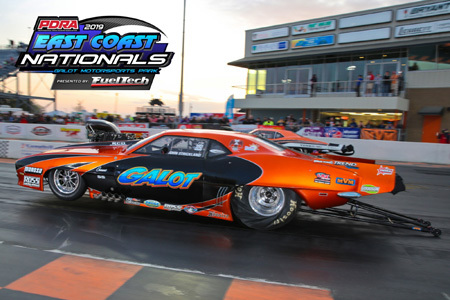 The 2019 PDRA East Coast Nationals presented by FuelTech will take place April 4-6 at GALOT Motorsports Park in Benson, N.C.
"We are extremely excited to have a new partnership with a new sponsor for 2019," said Tyler Crossnoe, race director, PDRA. "One of our goals for 2019 is to bring new faces and names to the PDRA and by offering a new event presenting partnership, we have opened the door to new partners like FuelTech." FuelTech has been an industry leader and a go-to company for drivers in classes across drag racing. Celebrating its 16th year on an international scale, FuelTech USA started in 2015 and has already shown impressive growth, offering innovative products that have been praised for their painless installation. The FT series ECU's built-in interface allows the user to have full control of the engine without the use of a PC, allowing for extreme convenience. "FuelTech has done a great job of promoting their products across a number of markets in the past few years," Crossnoe said, "and we are proud to announce they are furthering their Pro Modified branding by signing on with the PDRA series." Fans at the PDRA East Coast Nationals presented by FuelTech can expect thrilling eighth-mile drag racing in a variety of professional and sportsman categories. Moroso Pro Boost, Switzer Dynamics Pro Nitrous, Liberty's Gears Extreme Pro Stock and Pro Outlaw 632 are on tap, as well as Atomizer Racing Injectors Outlaw 10.5 presented by Drag965. Sportsman racing will include MagnaFuel Top Sportsman Elite 16 and Top Sportsman 32, Lucas Oil Top Dragster Elite 16 and Top Dragster 32, and Edelbrock Bracket Bash. The future stars of the PDRA will compete in Coolshirt Systems Pro Jr. Dragster and Gilbert Motorsports Top Jr. Dragster. Drag965 Pro Nitrous Motorcycle, racing on a six-race schedule in 2019, will join the tour at the PDRA Mid-Atlantic Showdown at Virginia Motorsports Park in May. "The season opener at GALOT has always been one of the best events of the year for the PDRA," Crossnoe said. "We hope to continue this trend in 2019 with the FuelTech partnership." The PDRA East Coast Nationals presented by FuelTech will cover three days: Thursday testing, Friday qualifying and Saturday eliminations. A detailed run order and daily schedule will be announced soon.